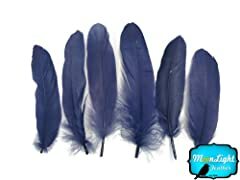 Moonlight Feather, Goose Feathers - Navy Blue Goose Satinettes Loose Feathers - 0.3 Oz. 4-6 inches long. Great for craft or costume projects. There are around 30-40 feathers in this 0.3 oz pack. Order by 12pm PST M-F for same day shipment. Closed weekends and national holidays. Each feather is approximately 5-6 inches long. Great for fashion design, arts and crafts, millinery and jewelry. Please note that these are a natural product so no two are identical. Yours will be very similar to the photo. 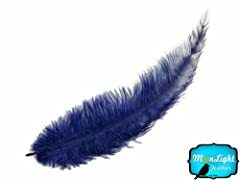 Check out our video on You Tube, search "Moonlight Feather"
5 Feathers per pack. 8-10 Inches Long. 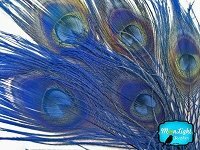 These are top quality natural feathers that have been bleached and dyed. 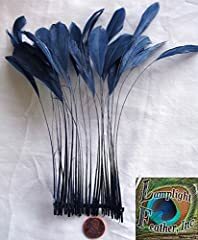 These are dyed natural feathers so each is unique. Order by 1pm PST M-F for same day shipment. 30 days money back on unopened products. 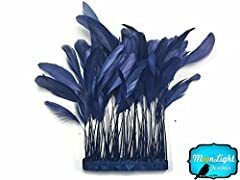 20 navy blue mini ostrich feather spads. These are beautiful, navy blue ostrich spads. Please note that these ostrich feathers are a natural product so no two are identical. Yours will be very similar to the photo.